It's been ten years since the start of the Great Recession. That's an arbitrary anniversary, sure. But downturns need beginnings, and the National Bureau of Economic Research decided this one happened in December 2007, when employment peaked and started to head south -- for two long years. What followed: The loss of more than eight million jobs, half the value of the Dow and the S&P 500, and trillions of dollars in retirement accounts and household wealth. Lives and businesses were ruined and whole neighborhoods emptied out, as banks took back homes bought on badly underwritten credit. A decade later, the American economy has recovered in many ways. Employers have been steadily adding jobs since early 2010, the stock market is booming and home prices have reached new all-time highs. But in other ways, Americans still carry the scars of the recession, some of which will never heal. Take Karen Moyers, 58, of Conroe, Texas. After building up her savings in the hairdressing business, she lost nearly all of it in an investment fund managed by a financial advisor during the crash. Now, she is working in a jewelry store for lower wages than she once made and only has enough savings to live on for about a year should she lose her job. "I can't save any money like I used to," Moyers said. "You think it'll come back, and it never came back." One decade later, here's where the economy has recovered and where it still has a ways to go. 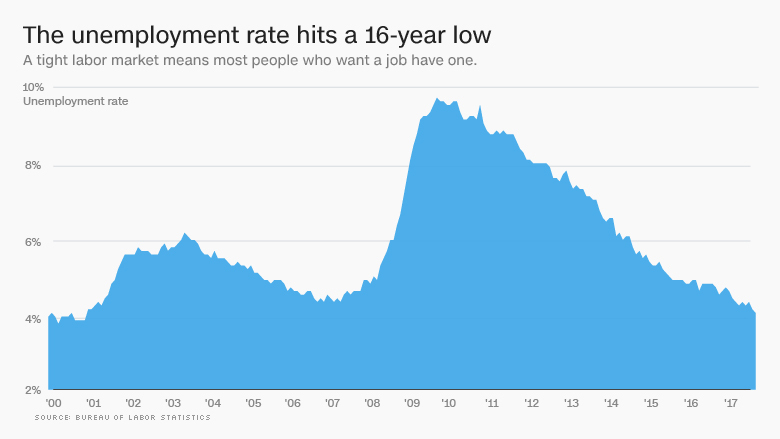 One of the most remarkable aspects of America's rebound is the unemployment rate. It sunk to a 16-year low of 4.1% in October, with some industries — like trucking, construction, and oilfield services — reporting difficulty finding workers. Even a more expansive measure of unemployment -- which includes people who want a job but have been discouraged from looking for one and those who work part-time but want to work full-time -- has matched its pre-recession low of 7.9%. But even that isn't the whole story. The share of Americans who are working or want to work has been falling for a couple decades, from a peak of 67.3% in 2000 to 62.5% in 2015. In large part, that reflects how America's workforce is getting older and retiring faster, and economists at the Federal Reserve Bank of Dallas expect the overall rate to keep falling. 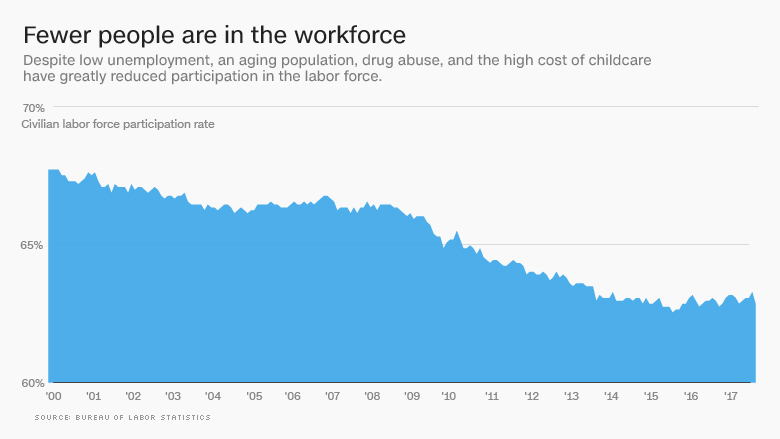 Still, participation rates for prime-age workers remain depressed as well, with large numbers of people sidelined by opioid addiction, low wages that make work less attractive, and the high cost of childcare that keeps women in particular at home. There is some good news: As the labor market has tightened up, employers have started to hire people who often face discrimination in the workplace, such as the formerly incarcerated, as Federal Reserve Board Chair Janet Yellen mentioned before the Joint Economic Committee this week. Partly as a result of the tighter labor market, African Americans have narrowed the labor force participation gap with white people in recent years, going from more than three percentage points below average labor force participation in 2011 to only half a point today. How have you fared in the 10 years since the recession began? 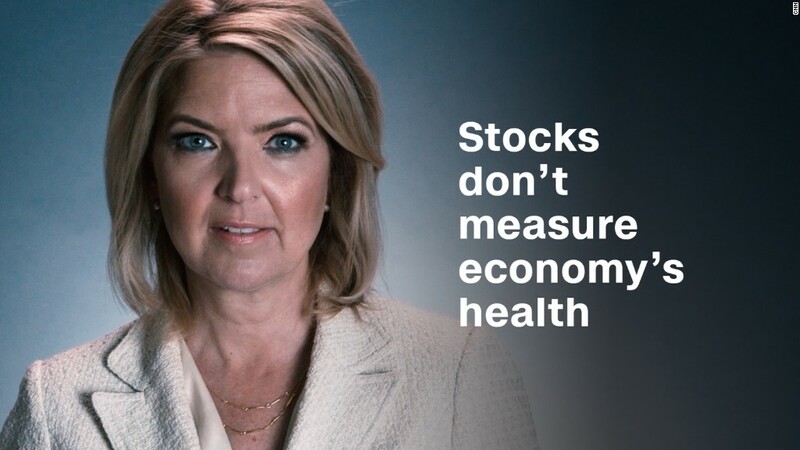 Click here to share your story with CNNMoney. For several years during the recovery, the big problem was wages: Even as hiring picked up, paychecks remained depressed. That started to change around 2015, as state and local minimum wage hikes kicked in and employers started raising base pay to attract and retain good workers. 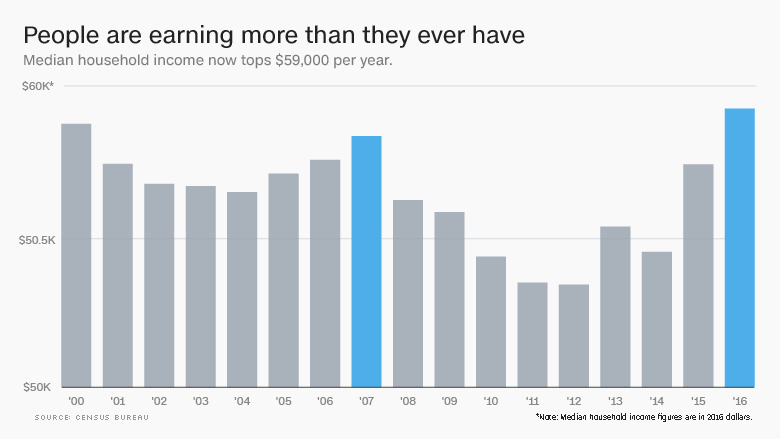 Now, median household income is back up to approximately where it was in 2007, at just above $59,000 a year. In 2016, the Federal Reserve found that 70% of adults reported living comfortably or doing okay financially, up from 62% when they began asking the question in 2013. But the recession didn't just impact earnings — it also took a sledgehammer to savings and investments. 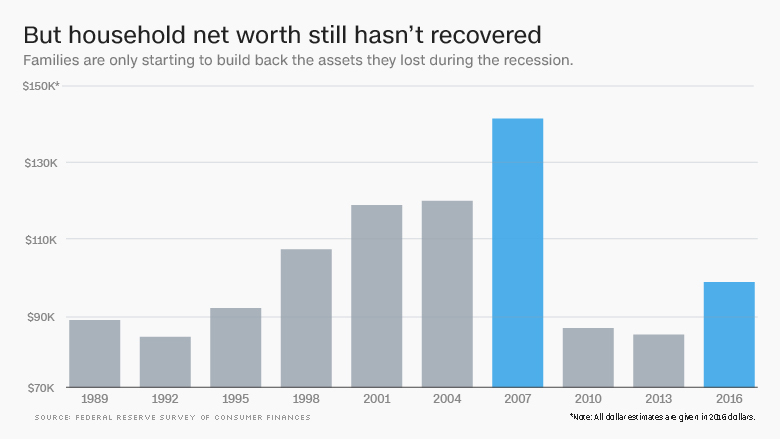 The median household's net worth dropped by 40% between 2007 and 2013, according to a triennial survey by the Fed, and had only recovered slightly by 2016. "It's no surprise that people aren't back to where they were in 2007, but incredibly striking that we haven't gotten back to where we were 20 years ago," said Harvard University economics professor Karen Dynan, a former chief economist at the U.S. Treasury Department. "Even more so because people have gotten older and closer to retirement." Net worth is also highly stratified by race, with black households holding one-tenth the assets of white households. Also, wealth inequality by income level grew to its widest point ever in 2016. The decline in net worth has implications for retirement security, with 28% of Americans over age 18 claiming no savings whatsoever, a 2016 Fed survey reported. Still, Americans are feeling better about their prospects, according to Gallup: 54% of those who haven't retired yet say they'll be able to live comfortably when they do. That's up from 38% in 2012, but still below pre-recession levels. A big part of the plunge in household net worth had to do with housing. As the financial crisis deepened, the delinquency rate for single-family mortgages spiked to 11.5%, and millions of homes went into foreclosure. In three years, the total amount of equity held by homeowners was cut in half. 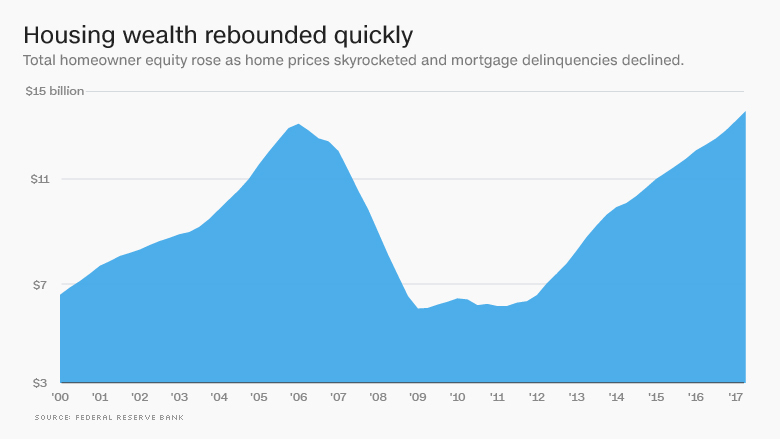 Now that the real estate market has recovered and mortgages have stabilized, household equity has bounced back to exceed its pre-recession high. The delinquency rate has also steadily been sinking back towards its 2005 low of 1.42%. 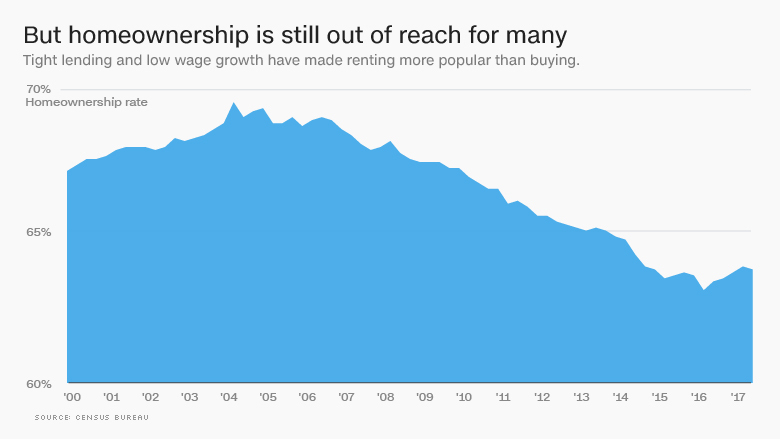 However, owning a home just isn't as popular as it used to be. The homeownership rate sank from 69.4% in 2004 to 63.1% in the middle of last year, and has only just started to bounce back. The reasons behind that trend are complex. First-time homebuyers have been locked out of the market by tight credit, shaky incomes, hefty student loan debts, and skyrocketing home prices in cities with available jobs, forcing many younger people onto the apartment market. Although many of them neither rent nor buy: One in three young people lived with their parents in 2015, up from one in four a decade earlier, the Census Bureau reported. In recent months, economists have been scanning the horizon for another crisis that could destabilize American families, identifying everything from rising interest rates to subprime auto loans as potential risks. In a speech this month at the Brookings Institution, Federal Deposit Insurance Corporation chairman Martin Gruenberg warned against proposals in Congress aimed at weakening the regulations that were passed in the wake of the financial collapse. "History shows that the seeds of banking crises are sown by the decisions banks and bank policymakers make when they have maximum confidence that the horizon is clear," Gruenberg said. Dismantling the Dodd-Frank rules that keep those institutions in check and protect consumers, he said, will make it harder to protect the economy from a crisis like the one that happened a decade ago.